Be on the lookout for this tearpad at Publix that says "Get Simple Summer Saves at Publix". 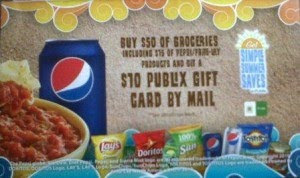 It is for a rebate for a $10 Publix gift card when you buy $50 of groceries including $15 of Pepsi/Frito Lay products between 6/24 and 7/28! I have not seen the form yet at my Publix, but I have found that sometimes they will keep them at Customer Service. So be sure to ask at your customer service to see if they might have them or know where they are.